This unique heat mouldable insole provides customised support with added thickness and optimum support to treat a variety of foot and leg conditions. You get the perfect amount of arch support you need as the insoles mould to your feet. Our Dr Foot Custom Insoles cost less than traditional custom orthotics because they use a special heat to fit technology. Heat to fit technology allows everyone to get a custom fit without the high cost associated with visiting a health care professional. Dr Foot Custom Insoles are truly a revolution in foot care technology! 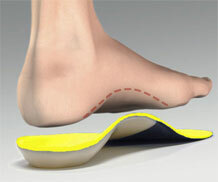 Dr Foot Custom Insoles are designed to treat over pronation and provide maximum support. Ideal for patients seeking arch support for prevention and treatment of flat feet.